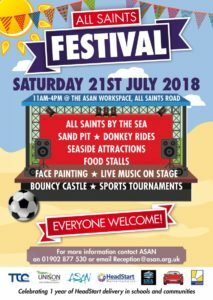 The annual All Saints Festival will be taking place on 21st July this year with the theme “All Saints by the Sea” meaning you will see many of your favourite seaside attractions, including; Donkey Rides and a Sand Pit. There will also be food available for when you start to feel peckish, with options such as Fish and Chips, Veggie Samosas and Barbecue Foods. While you eat you will be able to enjoy live performances on our stage or take a look around the many stalls that will be attending.